Cytokines play an important role in inflammation and immunity. Macrophage migration inhibitory factor (MIF) was one of the first cytokine activities described and is a proinflammatory cytokine that plays an important role in systemic inflammatory events. MIF's cytokine activity was initially described as a T cell-derived factor that inhibited the random migration of macrophages, hence its name. Since it was cloned and expressed in pure form, MIF's activities have been established to play many roles in development and various disease states. For example, MIF is released from macrophages and T cells in response to physiological concentrations of glucocorticoids. The secreted MIF counterregulates the immunosuppressive effects of steroids on immune cell activation and cytokine production. In in vitro experiments MIF is significantly upregulated by the stimulation of lipopolysaccharide (LPS) using 10 pg/ml to 10 ng/ml of LPS and reaches the maximum 12 h after the stimulation. MIF also prevents cleavage of Bax into an 18-kDa active fragment, and, consequently, reduces activation of the critical effector caspase 3, suggesting that MIF inhibits apoptosis pathways proximal to mitochondria activation and is therefore a survival factor. And, MIF is also known to exhibit enzymatic activities. 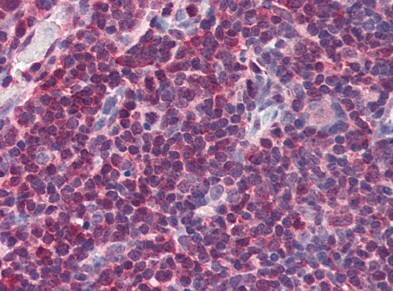 A pathologic role for MIF has been described in many conditions including arthritis, asthma, and inflammatory bowel disease, and may also play a role in the control of cell growth in certain cancers. 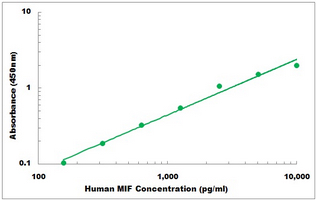 Consequently MIF is suggested to be a potential therapeutic target for human diseases. 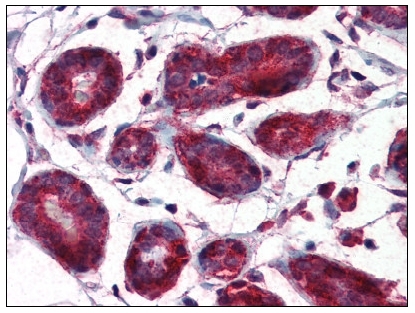 SM6013 MIF antibody staining of Formalin-Fixed, Paraffin-Embedded Human Breast. ICC/IF analysis of MIF in HeLa cells line, stained with DAPI (Blue) for nucleus staining and monoclonal anti-human MIF antibody (1/100) with goat anti-mouse IgG-Alexa fluor 488 conjugate (Green). 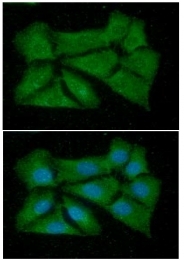 ICC/IF analysis of MIF in Balb/3T3 cells line, stained with DAPI (Blue) for nucleus staining and monoclonal anti-human MIF antibody (1/100) with goat anti-mouse IgG-Alexa fluor 488 conjugate (Green). Flow cytometry analysis of MIF in HeLa cell line, staining at 2-5ug for 1x106 cells (red line). The secondary antibody used goat anti-mouse IgG Alexa fluor 488 conjugate. Isotype control antibody was mouse IgG (black line). Western blot analysis: The cell lysates (40 µg) were resolved by SDS-PAGE, transferred to PVDF membrane and probed with anti-human MIF antibody (1/1000). Proteins were visualized using a goat anti-mouse secondary antibody conjugated to HRP and an ECL detection system. Lane 1: Jurkat cell lysate. Lane 2: THP-1 cell lysate. Lane 3: HeLa cell lysate. Lane 4: U937 cell lysate. 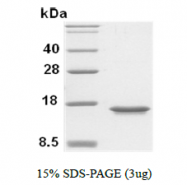 Western blot analysis: The extract of HL-60 was resolved by SDS-PAGE, transferred to PVDF membrane and probed with anti-Human MIF antibody (1/1,000). 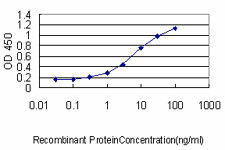 Protein wasvisualized using a goat anti-mouse secondary antibody conjugated to HRP and an ECL detection system. 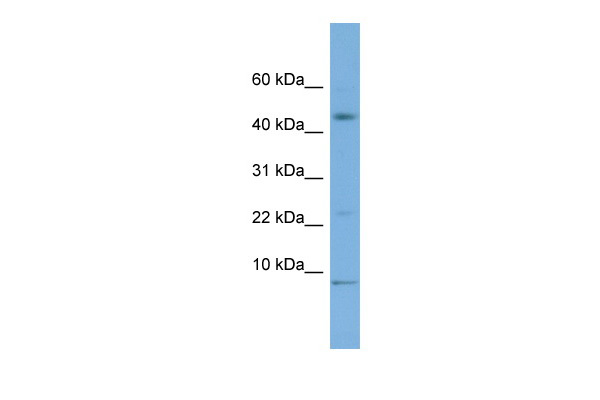 Western Blot analysis of MIF expression in transfected 293T cell line by MIF monoclonal antibody (M01), clone 2A10-4D3.Lane 1: MIF transfected lysate(12.5 KDa).Lane 2: Non-transfected lysate. 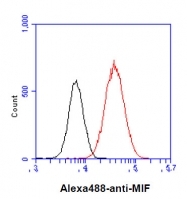 Detection limit for recombinant GST tagged MIF is approximately 0.1ng/ml as a capture antibody. MIF polyclonal antibody ( Cat # PAB6796 ) ( 0.03 µg/ml ) staining of human thymus lysate ( 35 µg protein in RIPA buffer ) . Primary incubation was 1 hour. Detected by chemiluminescence. 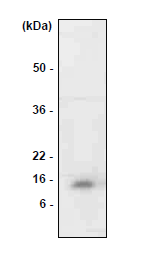 Western blot analysis of HL - 60 extract was resolved by SDS - PAGE , transferred to PVDF membrane and probed with MIF monoclonal antibody , clone 4E4 ( 1 : 1000 ) ( Cat # MAB1071 ) . 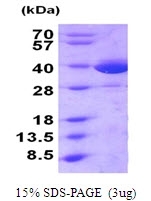 Protein was visualized using a goat anti - mouse secondary antibody conjugated to HRP and an ECL detection system. 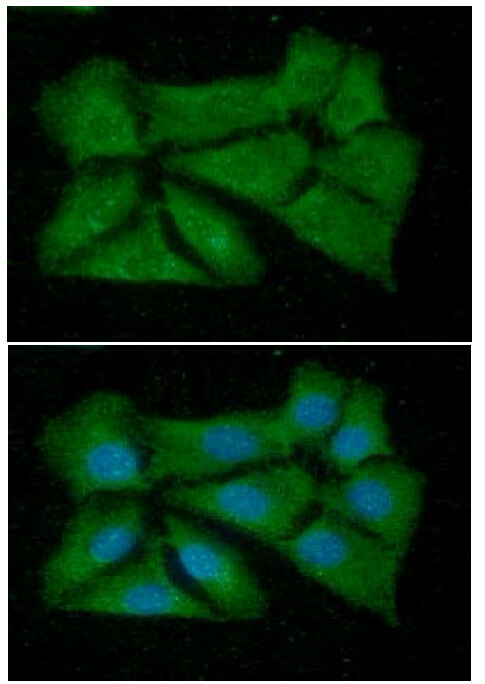 MIF MaxPab rabbit polyclonal antibody. 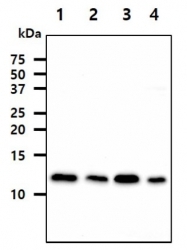 Western Blot analysis of MIF expression in human kidney. Western Blot analysis of MIF expression in transfected 293T cell line (H00004282-T01) by MIF MaxPab polyclonal antibody.Lane 1: MIF transfected lysate(12.50 KDa).Lane 2: Non-transfected lysate. 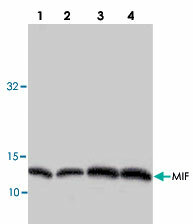 MIF MaxPab rabbit polyclonal antibody. 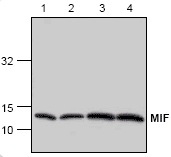 Western Blot analysis of MIF expression in Jurkat. 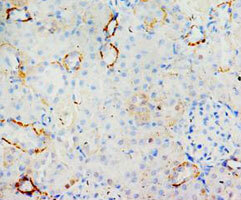 Immunohistochemical analysis of paraffin-embedded rat kidney sections, stain MIF in cytoplasm DAB chromogenic reaction. Western blot analysis of MIF expression in lysates from Jurkat ( Lane 1, 2 ) , NIH/3T3 ( Lane 3 ) and rat kidney ( Lane 4 ) . 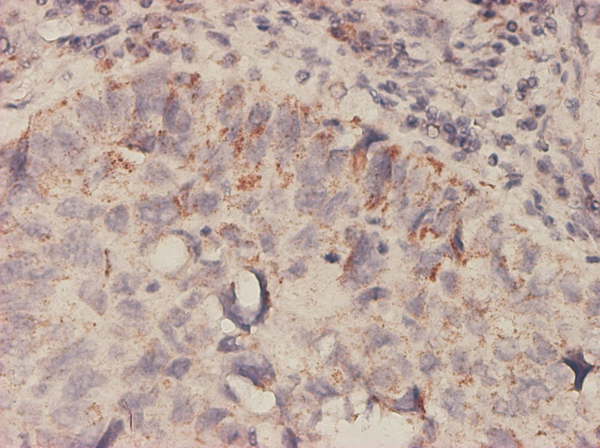 MIF Antibody (0.01µg/ml) staining of Human Thymus lysate (35µg protein in RIPA buffer). Primary incubation was 1 hour. Detected by chemiluminescence. 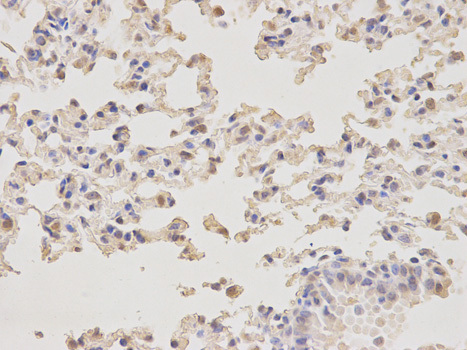 TA303028 (0.03µg/ml) staining of Human Thymus lysate (35µg protein in RIPA buffer). Primary incubation was 1 hour. Detected by chemiluminescence. 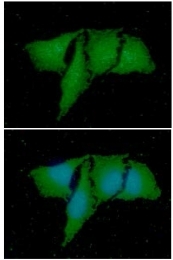 TA303028 (0.01µg/ml) staining of Daudi (A) and Jurkat (B) lysate (35µg protein in RIPA buffer). Primary incubation was 1 hour. Detected by chemiluminescence. Western blot analysis of MIF expression in lysates from Jurkat (Lane 1, 2), 3T3 (Lane 3) and rat kidney (Lane 4). 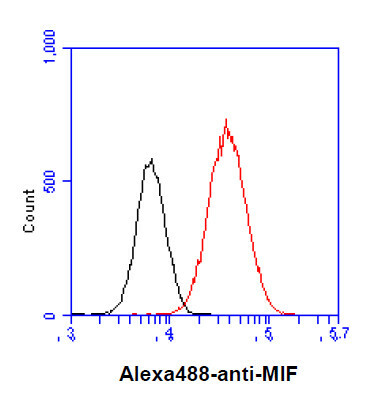 WB analysis of Immunochemical's IgY fraction of Chicken-anti-Human MIF polyclonal antibody shows the detection of 100 ng of recombinant MIF present in a lysate. 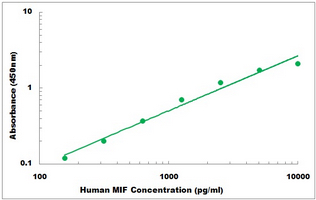 Similar detection of MIF will occur when human serum is analyzed. In lane 1 no reaction is observed in the control whereas lane 2 shows a single band at 12.3 kDa. 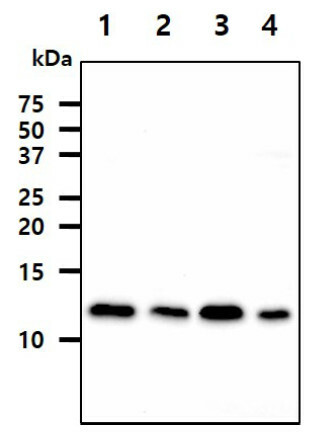 Western blot analysis of extracts of Jurkat cell lines, using MIF antibody. Immunohistochemistry of paraffin-embedded mouse lung using MIF antibody at dilution of 1:100 (400x lens).